The developers of that Atlantic Yards/Pacific Park project in Prospect Heights have implemented a color-coding system for the four companies of construction workers at the site, following reports of harassment from residents. PROSPECT HEIGHTS — There's a new code red for catcalls in Prospect Heights. 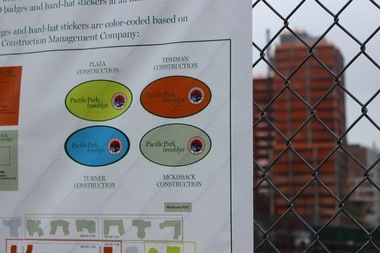 Pacific Park construction workers are now required to don color-coded labels on their hardhats to make them more identifiable — part of an effort to curb harassment that neighbors say plagues the massive development project formerly known as Atlantic Yards. Signs are now posted at the 22-acre site detailing colors that correspond to each of the four subcontractors working to build the Prospect Heights complex. Those working for Tishman Construction — responsible for building 535 Carlton Ave., 664 Pacific St. and 38 Sixth Ave. — will wear orange badges and labels, the signs read. Plaza Construction workers, assigned to towers under construction at 615 Dean St. and 550 Vanderbilt Ave., will wear yellow. Workers at 461 Dean St. — a tower nearing completion next to the Barclays Center that will contain half market-rate units, half affordable — will wear blue, Turner Construction’s color. All other workers, assigned to the two blocks south of Atlantic Avenue between Sixth and Vanderbilt avenues where work is being done on the LIRR rail yard, will wear beige for McKissack Construction, the signs say. The changes are being implemented following several reports from neighbors about harassment by Pacific Park workers made to developers Greenland Forest City Partners and local police in recent months, including one from a 23-year-old woman living on Dean Street who had been catcalled and insulted by a worker last December. Last month, the New York Daily News reported the details of that incident in a series about the effect of the complex on the neighborhood. Ashley Cotton, senior vice president of External Affairs for GFCP, said in a statement that the company is “committed to creating a safe, accountable work site at Pacific Park” and expects the new ID system to “bring an even greater level of transparency and accountability to the various components of our project." The company said hundreds of workers have already received their new identification and more are getting the badges and stickers every day. On Tuesday, two workers at 550 Vanderbilt Ave., a market-rate condominium building going up on the corner of Vanderbilt Avenue and Dean Street, read the public notices about the new identification system posted on the work site’s fencing. Both said they and all the building’s crew members had received their orange badges and hard-hat stickers that day, but had not been told what they were for. Capt. Frank DiGiacomo of the 78th Precinct gave residents a heads up about the new color-coding at a community council meeting last week, saying the new badges will help make it easier to identify who works for which company following a series of “complaints about construction workers,” he said. “When you have all different construction teams working, you don’t know,” he told residents. Wayne Bailey, president of the precinct community council and one of those residents who described being harassed by workers in the Daily News report, told DNAinfo New York he doesn’t think every construction worker is a problem, but thinks there is an “element” of workers who feel entitled “to do whatever they want to do,” whether that’s park on sidewalks or leave urine in bottles around the site — behavior he’s personally witnessed. “If it makes them really identifiable, I think that it would help tremendously,” he said. But he worries that the badges and stickers will be hard to spot on the uniforms of workers; instead, he suggested having big, block letters on the back of their vests, similar to those seen on restaurant deliverymen. “I think that that’s a small investment on Forest City Ratner’s part for a lot of goodwill in the community — if they had a way to identify at a distance, so you don’t have any confrontation,” he said. In letters posted around the construction site last week about the change, the developers said “GFCP has zero tolerance for illegal and inappropriate behavior” and encouraged residents to report harassment to police or, in a non-emergency situation, to alert the Pacific Park community liaison office at 866-923-5315.